Fusion world | How would 'halos' affect ITER? How would "halos" affect ITER? Fusion world | How would "halos" affect ITER? Halo currents—electrical currents that flow from the hot, charged plasma that fuels fusion reactions and strike the walls of fusion facilities—could damage the walls of fusion devices like ITER. Such currents occur during plasma disruptions and channel large amounts of electrical current from the plasma to the vessel walls. "These findings provide scientific guidance to the ITER team as they work to address the disruption problem," said physicist Clayton Myers, lead author of a paper that reported the findings in the journal Nuclear Fusion. The findings "place additional importance on the reliability of ITER's disruption mitigation system, which can alleviate the effects of halo current rotation," said Myers, who led the research project while at the US Department of Energy's (DOE) Princeton Plasma Physics Laboratory (PPPL) and now is a researcher at Sandia National Laboratories, another DOE national laboratory. In the halo current study, researchers compiled a database gathered from five tokamaks located around the world. The database contains information gleaned from more than 800 total discharges by the five machines, each of which confines plasma within magnetic fields to produce fusion reactions. "The goal of assembling such a database is to try to understand, based on all the work that's been done so far, whether we can project certain phenomena to next-generation devices like ITER," Myers said. 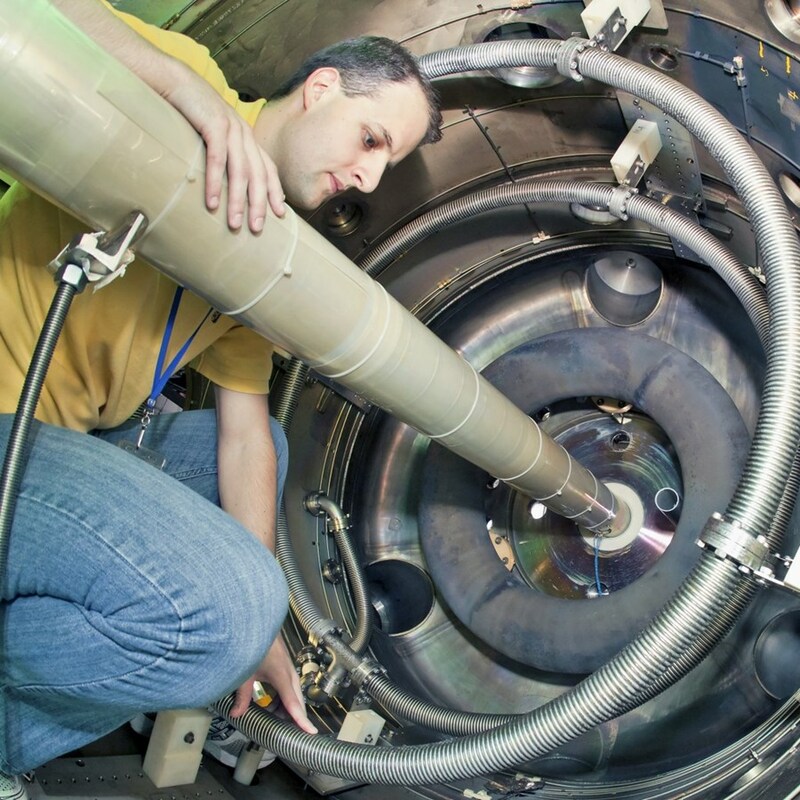 The machines included ASDEX-Upgrade, in Germany; Alcator C-Mod at the Massachusetts Institute of Technology; DIII-D, the national fusion facility operated by General Atomics for the DOE in San Diego; the National Spherical Torus Experiment (NSTX) at PPPL that has since been upgraded; and the Joint European Torus (JET) in the United Kingdom. Halo currents occur when the plasma undergoes large shifts within the vacuum chamber caused by lack of confinement during a disruption. These shifts can cause the plasma to come in contact with the chamber walls, allowing current to flow between the plasma and the walls. Such currents interact with the magnetic field of the tokamak to generate potentially damaging forces against the walls. These forces become more concerning if the halo currents bunch up on one side of the doughnut, pushing on one part and pulling on another part of the walls. Furthermore, the forces become more concerning still if the bunched currents also rotate around the tokamak in resonance with the structural components of the machine. The effect is similar to the combined resonance that can occur between soldiers marching in step and the structural elements of a bridge. The researchers examined the database and compared the behavior of halo currents in different machines to see how the velocity and duration of the halo current rotation changes in machines of different sizes. They then extrapolated the results to the ITER Tokamak. "ITER is on the boundary of suffering from this problem," Myers said. "The take-away is that we cannot rule out the possibility of this phenomenon occurring." Halo currents pose less risk in present-day tokamaks because the frequencies at which the currents rotate do not resonate with the structure of the machines. Moreover, the forces in today's tokamaks are mild compared to the forces expected in the huge, 23,000-tonne ITER. Going forward, scientists hope to study the magnitude of the asymmetric, or bunched, currents in order to project their strength for ITER. "Understanding the expected halo current magnitude would be another piece of the puzzle in terms of answering the question of how damaging the amplified forces could be in ITER," Myers said. This study was conducted under the auspices of the International Tokamak Physics Activity, an agreement organized by ITER to help develop fusion research. Funding was provided by the DOE Office of Science, the Euratom research and training programme, and the RCUK Energy Programme in the United Kingdom. Coauthors include Nicholas Eidietis, from General Atomics; Sergei Gerasimov, Tim Hender, and colleagues from Britain's Culham Centre for Fusion Energy; Stefan Gerhardt, from PPPL; Robert Granetz, from MIT's Plasma Science and Fusion Center; and Gabriella Pautasso, from Germany's Max Planck Institute for Plasma Physics. Read the original article on the PPPL website.